Jusqu'à présent Abdelhadi Kastih a créé 636 entrées de blog. 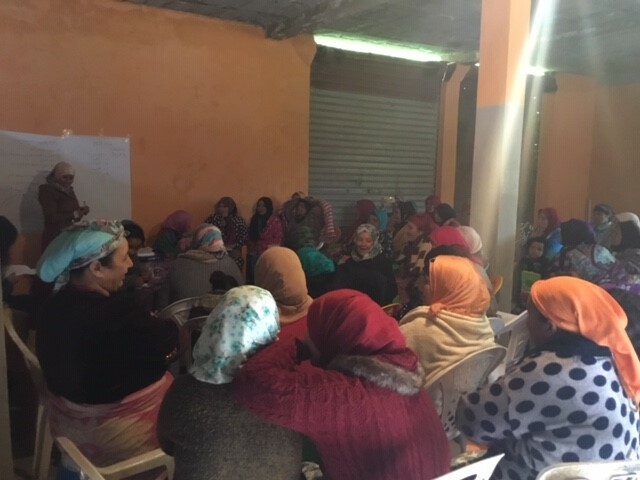 To maintain a successful scaling strategy for empowering Moroccan women on a national level, HAF invests in its staff to build their capacities and to expand the organization’s number of facilitators. 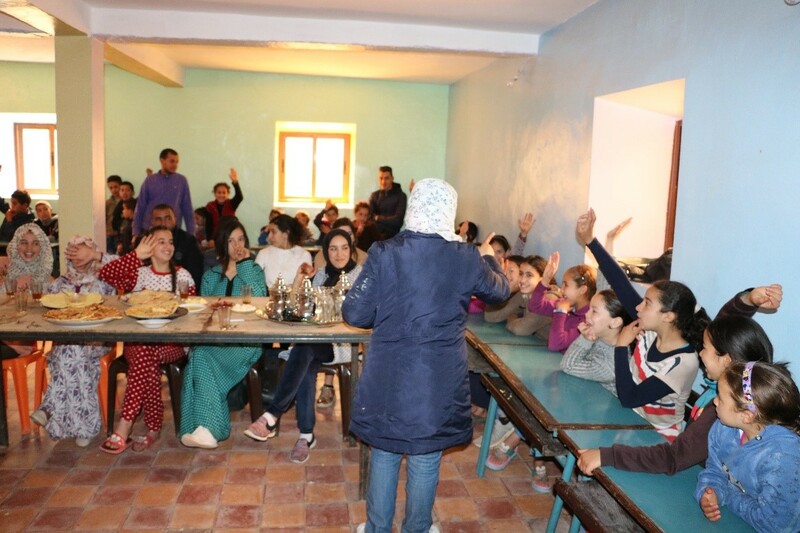 After the completion of her “observation phase” as an empowerment facilitator apprentice, HAF’s Project Director Amina El Hajjami scheduled a workshop to practice her skills on the 4th of April, 2019 in Al Haouz Province—a region in which HAF has extensively worked with local communities to implement development projects. 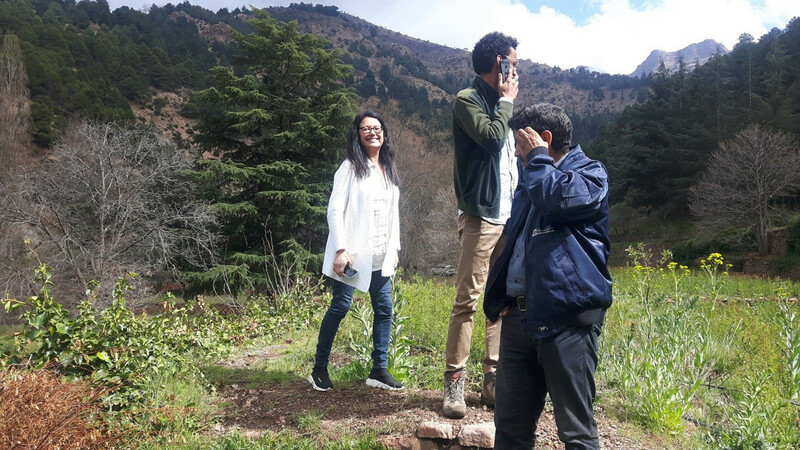 Amina, accompanied by a HAF U.S. board member, Ms. Martine Roberts, two female Moroccan volunteers, Sanae Benaadim and Houria Chouhab, and myself, Lead Empowerment Trainer, arrived in the rural village of Talaaint. 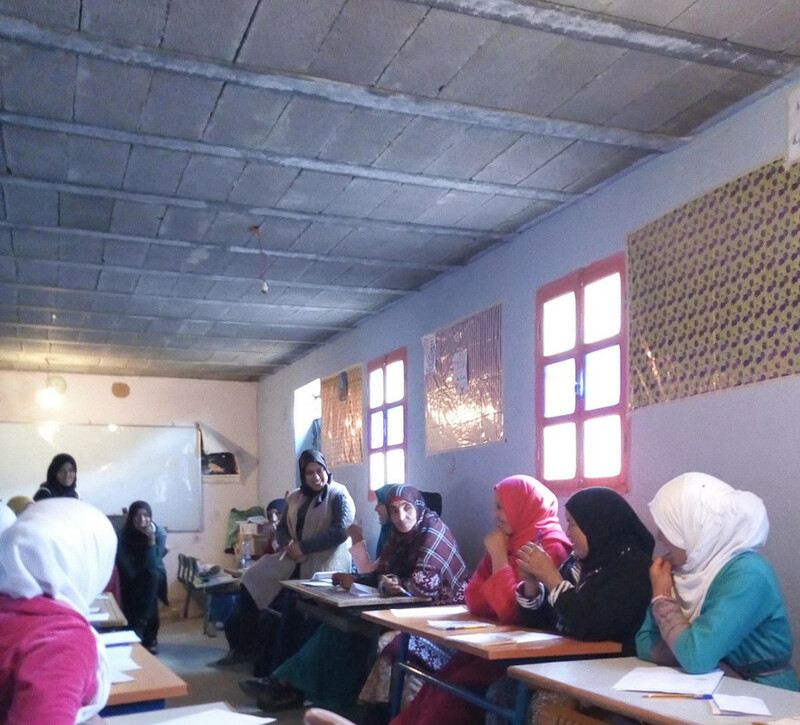 Forty-six Moroccan women aged between 16 and 60 attended the empowerment training, titled Imagine. 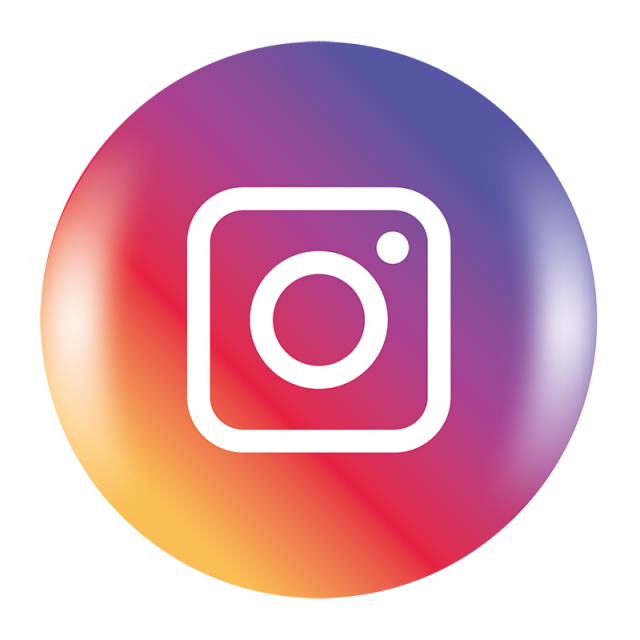 Initially, we were planning to conduct Imagine in accordance with its structured format; however, we were taken aback by the participants’ silence. Eventually, their evolving understanding that the training is a unique opportunity with the potential to lead to life changing achievements broke their hesitation. For example, first, explaining the concept of “training” took more time than we expected. However, using the local language and implementing the brainstorming method helped the women to start thinking, trust their answers, and to therefore become confident in publicly sharing their thoughts. We, as Imagine facilitators, have found that asking questions plays a great part in women’s understanding of concepts as well as their ideas and individual ways of thinking. 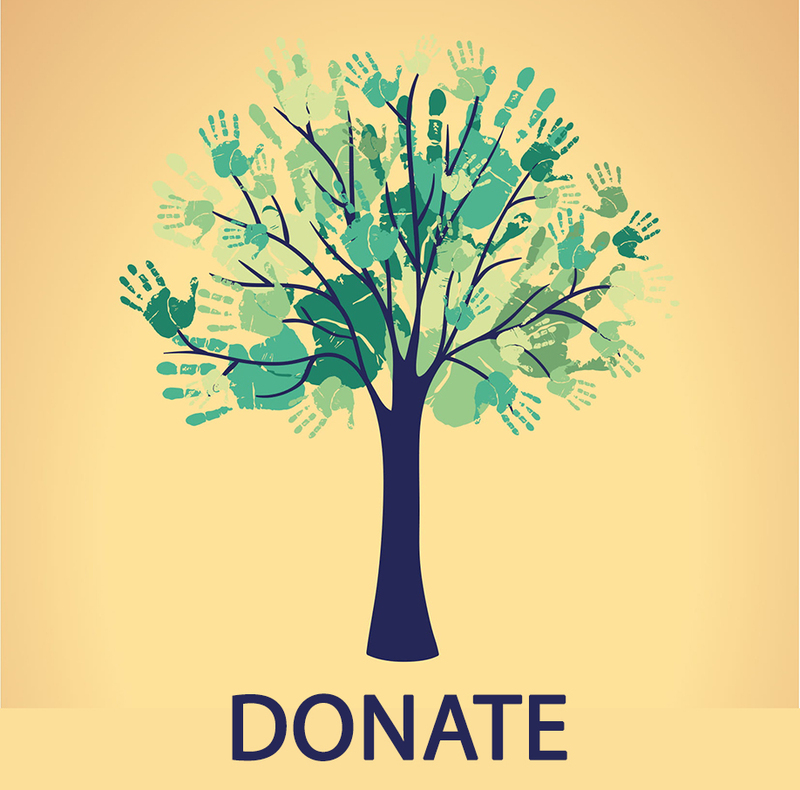 Further, it provides them with an opportunity to express their specific desires, goals, and needs. One of the participants shared, “If we ever attended school, we would not have been silent, and we would be able to express ourselves well.” Another participant said, “It was time to change our habits.” During their conversations, women used the word ‘tighri » several times, which in the Amazigh language Tashelheit means “learning.” They deeply believe that tighri is essential and could be the means to change both their livelihoods and status within their families and communities. Moreover, it could foster their development in becoming decision makers, which would consequently help them flourish as individuals. This open debate led the participants to speak about how they have looked at themselves regarding their roles within the family and, in addition, revealed their inner fears. To encourage the engagement of mind, emotion, and spirit, different tools were used including the meditation exercise, or what we call the “room exercise.” We explain the existence of meditation in Islamic nations, emphasizing that meditation is in fact an integral part of Islam. Specifically, the Prophet Muhammad, peace be upon him, was well known for his meditation practice. It was during this practice that he first received Qur’anic revelation. Thus, meditation opens the door of revelation, making it essential to spiritual development. For instance, when we facilitate a workshop with devout communities, meditation exercises are important simply because it is centered on oneself, helping one listen and feel for what feels truly right on a personal level. Usually, women enjoy this exercise because it helps them relax, deeply reflect on themselves, and to discover their inner resources and own truth. In regards to Guided Visualization, I have noticed that imagination is perhaps the most underutilized resource for many participants, but when they expand and unleash their imagination you discover it is more important than their knowledge. Imagination is not limited and so, through it, participants can reveal and express their visions through drawing. At this time, innovation and creativity transpire and women’s abilities will positively transform their own life and their communities. Notably, sharing feelings and discussing problems is part of the Moroccan culture. Openness can be very emotional, however, so splitting the group into small groups or pairing participants allows for easier conversation. For many women, to be open and comfortable to express their feelings, opinions, and ideas helps build trust between them. 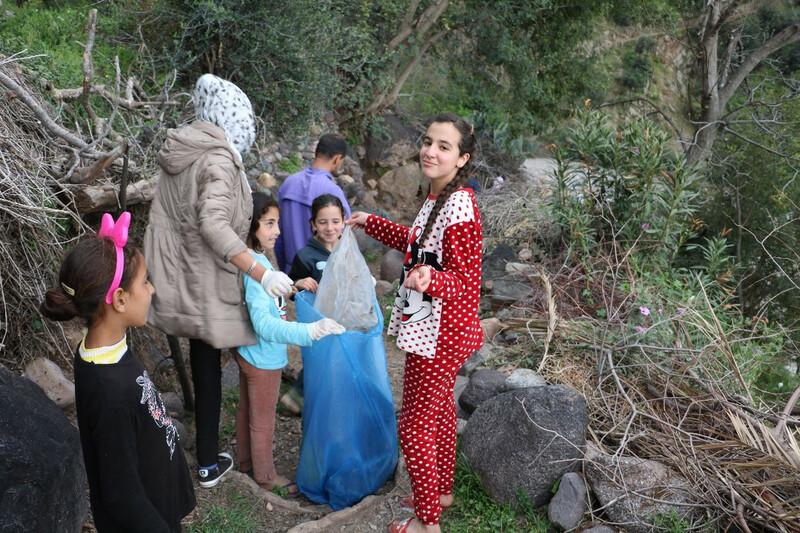 Ce mardi 9 avril 2019, la HAF s’est rendue à Tassa Ouirgane, une commune qui se situe dans les montagnes de l’Atlas à 90 kilomètres de Marrakech afin d’y réaliser une activité sous le thème de l’environnement. Le but de cette visite en partenariat avec le Programme des Nations Unies pour le Développement était dans un premier temps, de sensibiliser un jeune public sur l’écologie, puis de les accompagner dans la collecte de déchets ainsi que dans la création d’un compost qu’ils pourront par la suite entretenir dans la commune. Cette journée fut encadrée et animée par Amina El Hajjami (directrice de projet à la HAF) qui était accompagnée d’Ilyas Dkhissi (responsable de réseaux sociaux, photographe et réalisateur de films à la HAF), Fatima-Zahra Lahrire, Abdeljalil Ait ali, Rachid elouahSoussi, et moi-même actuellement en stage au sein de la fondation. Tout d’abord, nous nous sommes vus attribués un merveilleux accueil par les femmes du village qui nous avaient préparé un petit-déjeuner. Dans la matinée, Amina s’est tout d’abord concentrée sur la sensibilisation des enfants en matière d’écologie. Elle a défini la notion d’environnement, a questionné les enfants sur leurs connaissances sur ce sujet et ce que cela représentait pour eux. Ils ont ensuite pu chercher ensemble quelles étaient les causes, les solutions qui pouvaient être trouvées face à ces problèmes et se sont également interrogés sur la manière dont ils pouvaient protéger l’environnement, que ce soient avec des petites gestes ou des actions plus importantes. A la fin de cette présentation, les enfants ont pu évaluer ce qu’ils avaient appris et signer une feuille de présence, qui fut pour eux synonyme de prise d’engagement dans les ateliers sur l’environnement. La première action concrète s’est déroulée dans l’après-midi. Quelques enfants sont partis à la recherche des meilleurs endroits où collecter les déchets pendant que nous préparions le matériel pour la collecte. Tous les enfants et nous-mêmes se sont alors munis de gants et de sacs poubelles afin de ramasser le maximum de déchets possibles. Les enfants ont alors pu se rendre compte de la grande quantité de plastiques qui se trouvaient dans la nature et tous les sacs poubelles furent rempli à une vitesse incroyable, car les enfants débordaient d’énergie et voyaient cette action comme un réel défi. Quand tous les sacs poubelles furent pleins, Amina entreprit une activité de compostage. Elle expliqua aux enfants quelle était la différence entre tous les types de déchets et leur demanda de réunir des mauvaises herbes, des écorces et de la terre afin de commencer le compost. Les enfants devaient ainsi deviner si ces déchets étaient composés de nitrogène ou de CO2. Dans l’ensemble, les enfants se sont énormément investit du début à la fin dans toutes les activités que ce soit pour la sensibilisation ou pour les actions concrètes. Cette visite à Tassa Ouirgane n’était pas la première puisque la HAF s’était déjà rendue dans cette commune auparavant avec également comme thématique l’agriculture. Le but étant maintenant dans le futur de créer dans cette commune une coopérative de femmes afin de les responsabiliser dans cette thématique et de créer une agriculture responsable. C’était une journée très enrichissante au niveau humain, et voir à quel point les enfants et les jeunes femmes étaient reconnaissant pour les activités de la fondation était un but en soi. Today is the third day of the training. We can associate not only the faces with the names but also the faces with the voices. We develop the habit of meeting them first thing in the morning before the workshop and the last thing before we sleep. We had our breakfast quickly and then we hurried up to go and start the day. They made it that far and welcomed us with their smiles after hours of hard work. The number of participants grows day after day. From the feedback of the first participants, the other chose to join and participate. I had seen women who had never held a pen before, but they were keeping their notebooks and pens tight. They may not be able to write today or tomorrow, but I am quite sure they will write one day. They will make mistakes and try harder but they will certainly write one day. They will hold a pen and they will write their names. They will write the names they have been whispering in their heads all these years. The topic of today’s workshop was the body. Women expressed what they thought about the word “body”. The women associated the concept of “body” which is physical with other terms including power, time, mercy, and confidence. One of the activities aimed to push women to accept their bodies. They need to accept and to be proud of who they are. Unlike the first days, women and young women volunteered to stand up and speak publicly about themselves. They were finally able to speak about themselves. We were astonished by the new faces who wanted to talk about the way they see themselves. The second part of today’s workshop was about Money and work. Many women do not have a direct relationship with money since their husbands work and buy groceries for the house. However, they told us about a tradition in their village that women inherited from their ancestors. They chose one woman from the village and they gave her an amount of money each month. The chosen woman is responsible for saving the money and giving it back to the women who are in need throughout the year. They draw their vision about their work on a big paper in order to share it with all the participants. The last day of the training came. Unlike the previous days, most of the women were late because they were preparing couscous for their families. We started the workshop of today a bit late. The topic of today’s workshop was about religion and spirituality which goes along with the atmosphere of Friday prayer in the village. Apart from the new faces that participated throughout the three previous days, there were new faces that came to greet us and to wish us good luck. The women were actively participating and enjoying the discussion. It seemed that religion and spirituality play a major role in their lives. We finished the last workshop and the certifications were ready. The moment that we all were afraid of came. We said our final words and wishes with tearful eyes and trembling voices. It was hard for us to keep our smiles upon our faces and harder for them to keep their tears from falling. I honestly cannot remember how many times we hugged each other and how many times we said goodbye. Before we left the village, we went to see the river and the bridge. They sang songs of goodbye and of love throughout the road from and to the river. Their voices were strong and the nearby mountains echoed every sound perfectly. We were at the center of the village, hoping that this moment of goodbye lasted a bit longer. We shared pictures and phone numbers in order to make sure we keep contact. Finally, a few drops of rain came and before they stopped, we were gone. We kept in our minds the image of all the villagers standing and watching us when we left the village. La vie et la mort de communautés entières dépendent de la réalisation des 17 objectifs de développement durable (les ODD) adoptés à l’unanimité par les Nations Unies en 2015, dont l’éradication de la pauvreté, la conservation des forêts et la lutte contre le changement climatique. Prenons, à titre d’exemple, le peuple autochtone Amazigh qui vit dans les montagnes autour de Marrakech : ils sont représentatifs des populations qui ont besoin d’être les premiers bénéficiaires du développement durable. Grâce à un partenariat entre l’Université de Floride centrale (Orlando), le Centre Hollings pour le dialogue international (Washington D.C. et Istanbul) et la Fondation du Haut Atlas (Marrakech), nous avons récemment mené un travail de terrain dans le Haut Atlas, où nous avons parlé aux populations locales qui nous ont ouvert leurs cœurs. Le message le plus cohérent que nous ayons entendu de la part des habitants du Haut Atlas est que leur avenir dépendait de l’eau. Un groupe nous a dit que lorsque la pluie est abondante et ponctuelle, tout va pour le mieux ; à défaut, c’est une tout autre histoire. Ils craignent que le changement climatique ne se répercute sur la pluviosité ou que la pluie ne soit « pas/plus au rendez-vous ». Ils ont en effet de bonnes raisons de s’inquiéter, car le changement climatique devrait considérablement impacter les précipitations, ce qui réduirait les cours d’eau, les lacs et les nappes phréatiques. De fait, la sécheresse est un souci constant. La Banque mondiale estime que 37% de la population travaille dans l’agriculture, tandis que la production de céréales varie énormément en raison de la variation annuelle des précipitations – l’année 2018 a heureusement été une bonne année en la matière. Le changement climatique rendra les populations du Haut Atlas beaucoup plus vulnérables alors qu’elles vivent déjà à la limite de la survie. Dans l’une des régions – NdT : que nous avons visitées –, le changement dans le calendrier et dans la quantité des précipitations était déjà perceptible dans la perte importante d’arbres fruitiers. Dans cette même région, on nous a dit qu’il y avait une crainte qu’il n’y ait plus d’eau dans vingt ans et que, pour ces personnes qui sont profondément liées à la terre, il n’y ait plus « aucune alternative ». Les populations du Haut Atlas se retrouvent dans une situation extrêmement vulnérable. Un groupe nous a confié qu’il avait tellement besoin de ressources de base qu’il brûlait des déchets plastiques pour chauffer son eau. Pire encore, ils pensent avoir été laissés pour compte par la société et qu’ils avaient le sentiment que « les habitants des montagnes ne comptaient pas ». Ils estiment que la société marocaine est profondément injuste : il n’y a pas d’aide pour les malades, peu d’aide à l’éducation, peu de protection contre le froid ; et que, pour certains, la corruption est la plus grande menace pour un avenir durable. Par conséquent, la société civile a un rôle important à jouer dans la réalisation des objectifs de développement durable. 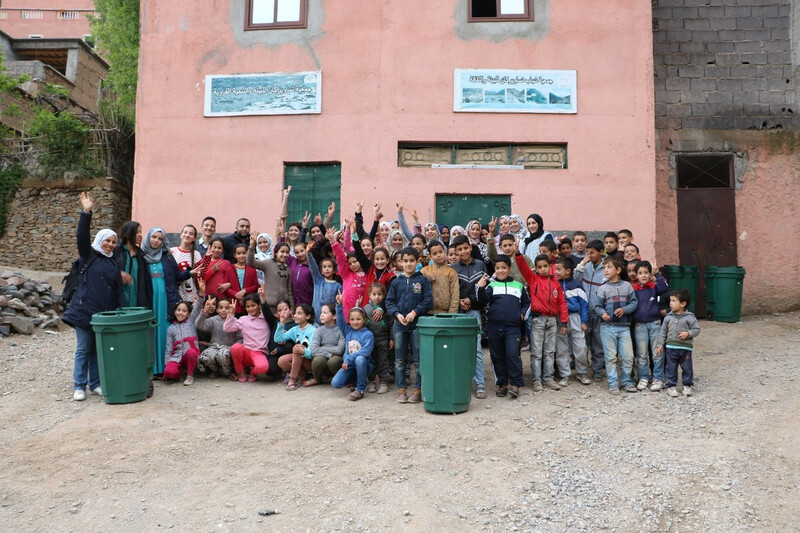 La Fondation du Haut Atlas s’emploie à aider les habitants de cette région à s’organiser en collectifs qui décident à la fois de ce que « le collectif » souhaite et des voies à suivre pour atteindre ces objectifs. Les femmes se sont organisées en coopératives dont elles sont les propriétaires et dont elles collectent le fruit (les dividendes) de leur travail (leurs produits). Les membres d’une coopérative ont constitué un lobby lors de la réunion sur le climat de la Conférence des Parties de 2015 à Marrakech. Des associations d’hommes ont développé des pépinières d’arbres qui non seulement génèrent des revenus, mais protègent également des bassins versants entiers – et donc leurs réserves en eau pour le futur. Ils participent également aux marchés de la séquestration du carbone. 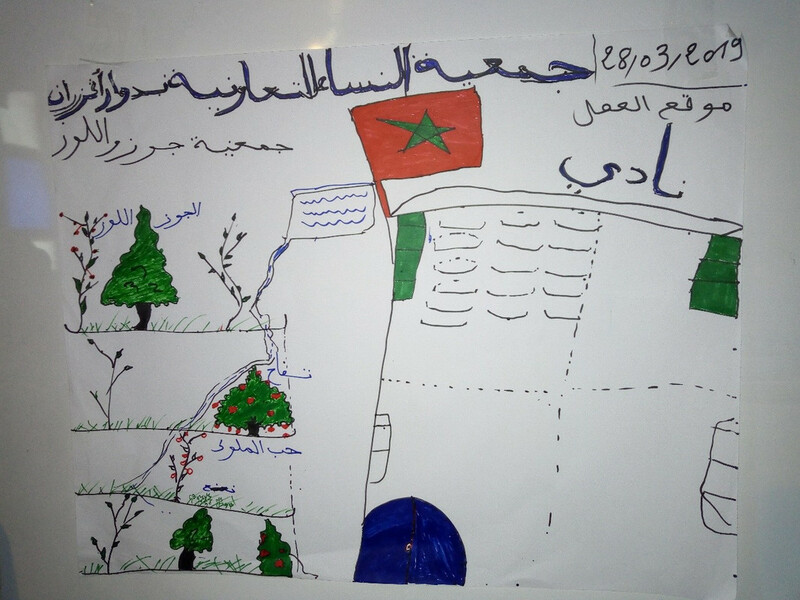 À cet égard, le Département régional de l’eau et des forêts de Marrakech leur fournit des caroubiers et l’autorisation de planter ces arbres dans les montagnes entourant leurs villages. Cependant, l’élément le plus important de ces collectifs est peut-être qu’ils donnent à chacun des membres qui les composent voix au chapitre. Les dirigeants de ces collectifs ont le droit formel de s’adresser directement aux gouvernements régionaux pour connaître leurs besoins, et cette voix ne serait pas entendue du tout sans cette organisation formelle en collectif. Ces organisations ne peuvent pas remplacer les services gouvernementaux, mais elles renforcent la capacité de la communauté. Non seulement, ces collectifs donnent aux gens une influence sur leur vie actuelle et sur celle de leurs enfants, mais ils s’aiment et ils ne luttent pas seuls. Nous pouvons témoigner d’une profonde solidarité. À plusieurs reprises, les collectifs nous ont dit : « Nous nous aimons, nous formons une famille », « Nous sommes comme un », « Nous nous entraidons » et la conviction que « je serai avec toi – à tes côtés ». Le monde est décidément en pleine mutation, et suit une voie non viable, donc si nous voulons atteindre les objectifs en matière de développement durable, tous les peuples comme celui du Haut Atlas doivent compter et leur voix mérite d’être entendue. Peter J. Jacques est Professeur de Sciences Politiques à l’Université de la Floride Centrale à Orlando, aux États-Unis. We started our day with a traditional breakfast prepared by the family hosting us. We could hear the voices of the girls coming from early morning to participate in the workshop. They have power and it is quite profound. A power that allowed them to survive all the difficulties the local nature imposes on them. The local population manages to save food and materials from the month of August for the whole winter. 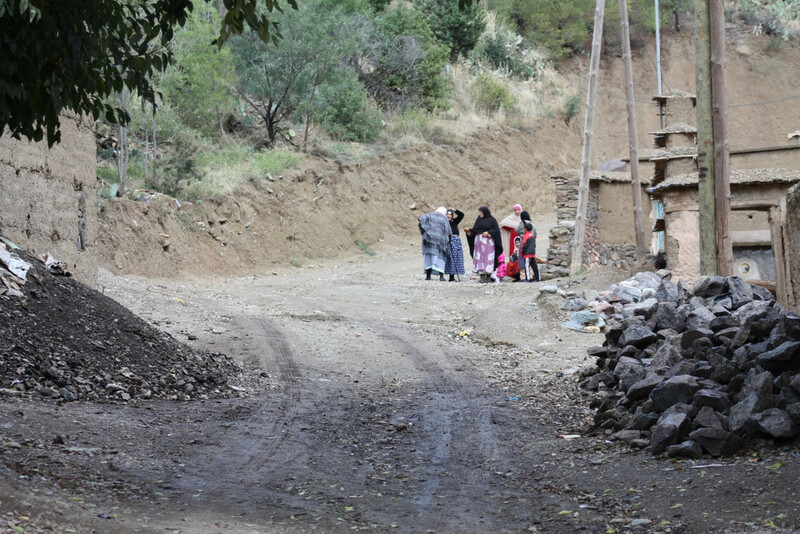 It is not only the case of the village of Agerzrane but all the villages nearby in the region–a population marginalized not only geographically but in every meaning of the word. The rates of drop out and repetition in primary education are high and the first elementary school was built only three years ago. All the young women in the village stopped schooling when they finished primary education and most of the boys did not register in secondary school because they need to work. We started our second day of the workshop with high expectations. We noticed that there are few new faces who have heard about the workshop from the young women who had participated. They were happy to find their names written in the first pages of their notebooks. They sat down in the same place and next to each other as yesterday. The workshop was about relationships and emotions. The warm-up activity was in the form of a brainstorming activity. Miss Ibtissam asked the women what they think about their relationships with the people in their social environment. After that, she explained what are the sources of power and support. 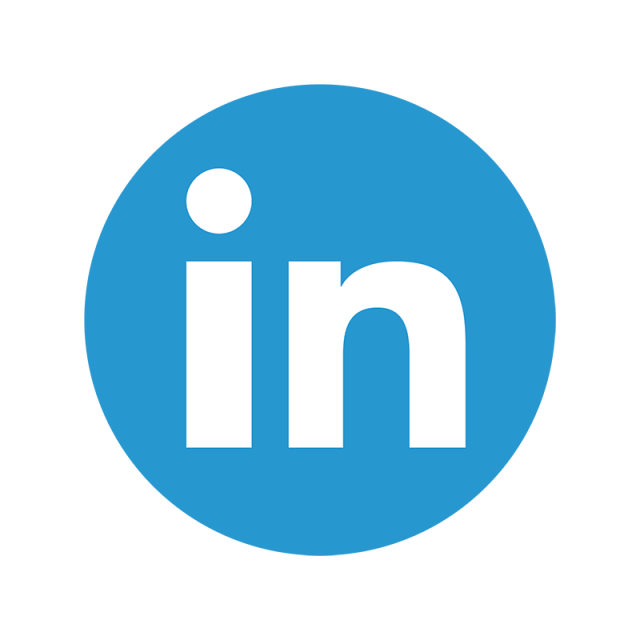 Engagement, perseverance, love, and interior orientation are just a few examples to state. Women tried to share their personal experiences, however, it was hard to push the young women to express their experiences. The next activity of today was an exercise called the “Seven Rooms”. Each room represents one of the sources of power. It was required from the women to close their eyes, listen to southern music, and imagine people or things that they saw in each room according to the source of power they can represent. After listening to music, the women opened their eyes and took a white page and tried to write and draw what they saw. Some of the women cried some were satisfied with tearful eyes and a smile. It was amazing to see the women helping each other to write and to draw. After the exercise finished, women shared the things they have jotted down during the exercise. One of the participants, who is teacher Khadija wanted to tell us about something that she found unusual. She said that when she entered the room of the support system all she could see was the white color. She admitted that her parents supported her throughout her life in every way possible and that her father passed away. Most of the young women who attended the workshop developed the habit of visiting us in our room after we finished the workshop. They gathered downstairs then they came to keep us company. Today was the day on which the villagers go to the market. There is a local weekly market called “Souk Larbaa” which means the market of Wednesday. Some of the women could not make it because they were obliged to go and shop for their families. Mr. Brahim visited us after he came from the market. He asked us about our impressions and about the reaction of the women today. We told him that most of the young women wanted to go back to school but they did not know if it is possible. I was astonished by his genuine intention to help the young women who dropped out of school or who wanted to register in secondary school. He explained to us that the roots of the social and economic problems that the region suffer from stem from the lack of schooling and quality education. 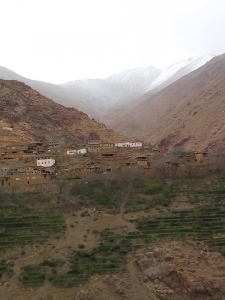 The majority of the villages in the Commune of Toubkal lags behind and they are now struggling to develop and move forward. Mr. Brahim told us about his personal experience with education. As a son of the village, he did not complete his primary education and went to Marrakech to work. His employer used to send him to buy newspapers without acknowledging that he couldn’t read or write. Mr. Brahim said that he forgot the names of the newspapers and that he regretted the fact that he couldn’t know the names in the first place and even more the fact that he couldn’t remember the words. He told his employer to write down the names of the newspapers which are “Le Matin” and “L’ Opinion” on a piece of paper. He told us sincerely, and with tearful eyes, that he blamed himself and he said: “I told myself that I’m a donkey. People can read what is inside the newspapers and I don’t even know the meaning of the title”. He took the decision to fight illiteracy by his own. He bought a fifty-page notebook and a pen and started trying to copy the letters of the words. The son of his employer saw him and offered his help. He told him that this is not the way words are written. He laughed when he remembered the first time he wrote his name and showed it to the son of his employer. He said to him that he wrote your name in parts. He bade us farewell because it was late. He had another meeting with all the men from the local community. The hosting family is valued in the village. It was at the center and all the villagers meet in it throughout the day. They discuss their problems, share their experiences, and eat together. We could hear their discussion from the windows of our room .After a couple of hours, everyone went to his house and all I could see is the dim light of the flashlights that they used to reach their homes. 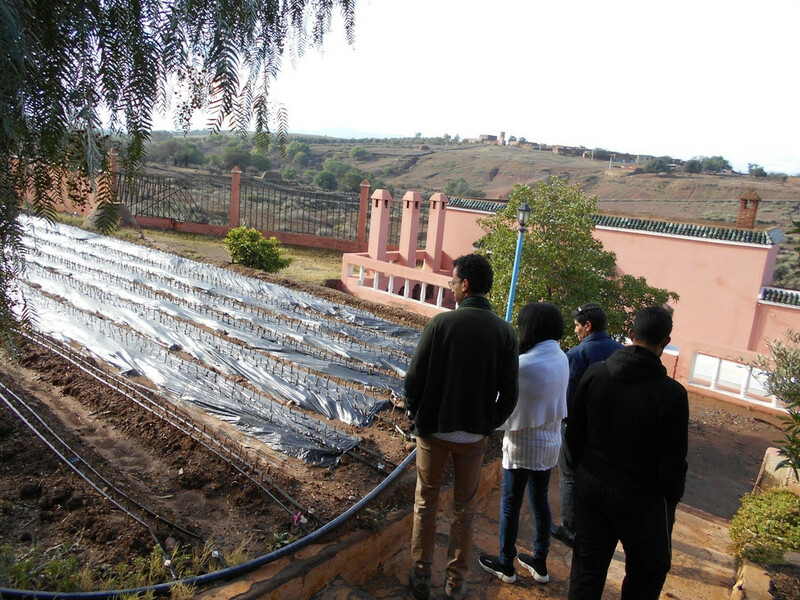 On Thursday, the 28th of March, the team of the High Atlas Foundation (HAF) visited with HAF Board Member Martine Roberts the nurseries of Akrich, Imegdal, and Tadmamt. Our first stop was the Akrich nursery where HAF planted over 30,000 almond and fig seeds. All seeds and cuttings in the nursery are covered with black plastic to increase soil heat and moisture, which enables them to grow faster. Furthermore, all seeds and cuttings are watered regularly using drip irrigation, which provides exactly the right amount of water for every sapling and thereby conserves the precious water resource. The wonderful aspect about this nursery is its cultural value. 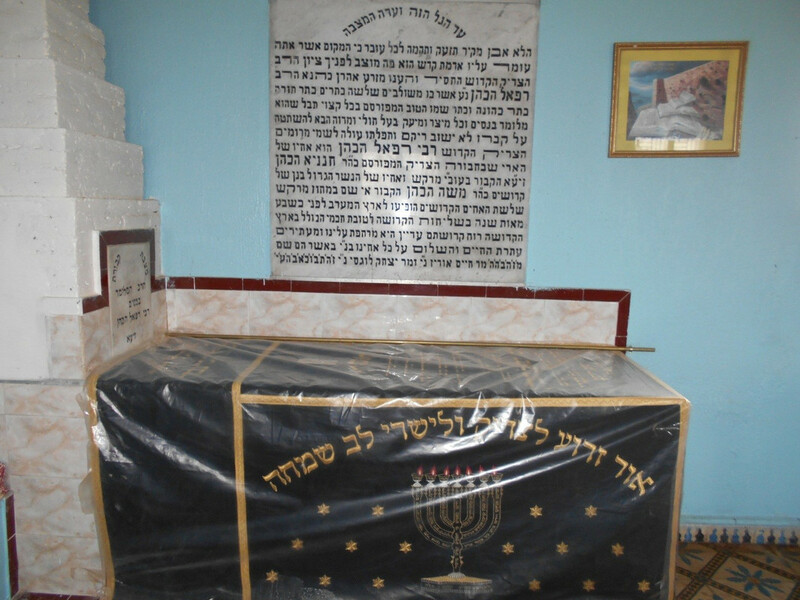 While being a nursery, which provides much needed tree saplings to communities all over Morocco, the place is also a Jewish cemetery, where the saint Raphael Ha Cohen is buried. Many pilgrims visit regularly to pray for good health for themselves and their loved ones at the tomb of the Saint, who was known for his healing powers. After our visit to the nursery and cemetery, we enjoyed a homemade breakfast and then set out for the next nursery in Imegdal. On our way to Imegdal we admired the beautiful countryside along the Ouirgane Dam. 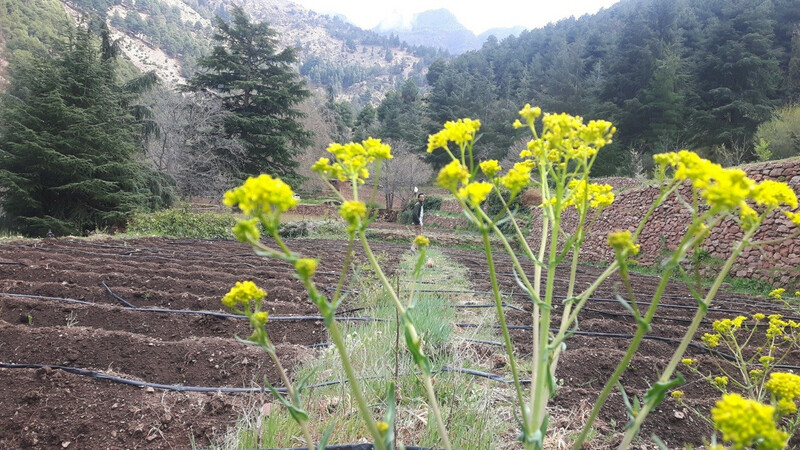 At the Imgdal nursery, HAF planted over 30,000 walnut and 6000 almond seeds as well as thousands of medicinal plants (sage, pelargonium, rosemary, and Cyprus). In addition to walnut, almond, and medicinal plants, the Imgdal nursery is also specialized in the germination and plantation of argan seeds. 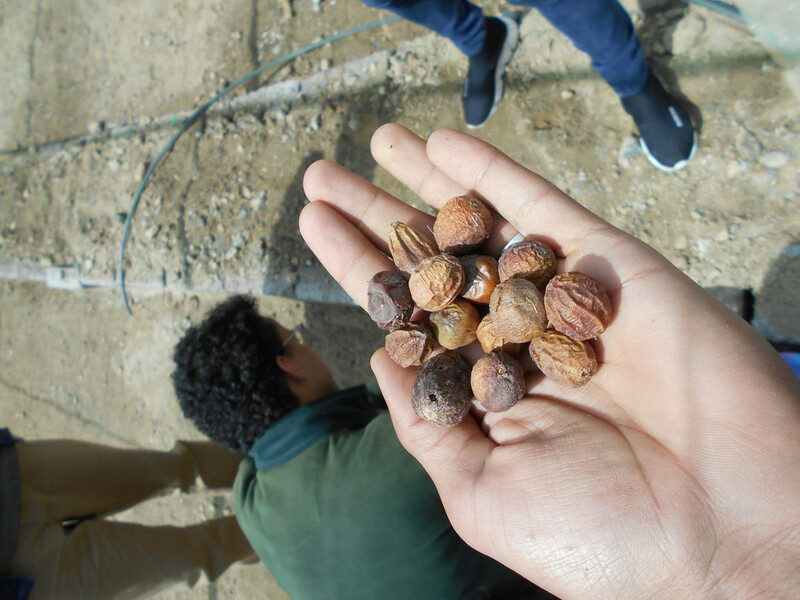 Hassan, the nursery caretaker, showed us how to prepare the argan seeds for germination in a greenhouse, which is necessary to protect the seeds from harsh weather conditions and to provide the necessary heat. We also talked to Hassan about the irrigation system. He showed us the water storage on top of a hill, which is connected through pipes to the nursery. It was very clear how committed he is to the nursery and how much care he gives, much like a father for his kids. He proudly explained to us that some plants in the Caddi Ayad University are named after him. Afterwards we headed to the last nursery of Tadmamt, which is one of the biggest HAF nurseries and currently keeps over 1500,000 seeds of almonds, walnut, and cherry. After spending the whole day exploring these three beautiful nurseries, we gained good insight into the techniques used in the nursery to ensure successful germination and growth and we experienced the dedication and care that is given to each individual seed and cutting. Our field visit finished with a feeling of sincere appreciation of HAF’s work, which creates life and hope with every single sapling given to a community member. 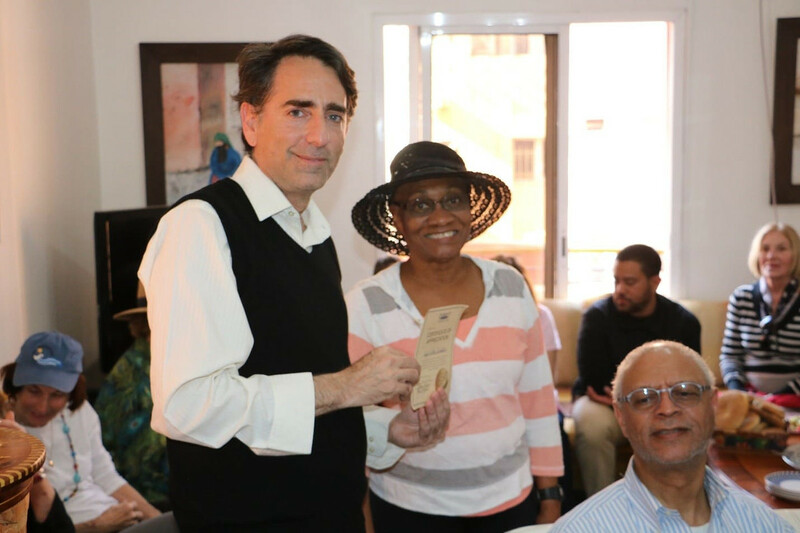 The High Atlas Foundation had the great pleasure to welcome former Fulbright Scholars from the United States to its office in Marrakech. It was a great feeling to be together, people with the shared commitment to utilize opportunities for research and education to measurably move forward the people’s development. Our recent visitors also host international participants of the Professional Fellows Program. One HAF colleague, Kamal Akaya, is already an almuni of this educational and cultural exchange program, run by the U.S. Department of State. A second colleague, Said Bennani, will be embarking on this six-week leadership- and partnership-building journey in the United States later this month. The topics that we discussed together with the former Fulbrighters went to the heart matters: What obstacles do women face as they pursue the change that they seek in their lives? What priorities do rural communities identify in order to fulfill their dreams? How and why is Morocco a bastion of opportunities, and how may its people be in a better position to better fulfill them? Who are we as an organization of people dedicated to Moroccan sustainable development, how have we come to this point, and what are and were our journeys to make us unified and determined to hear communities and assist them in implementing their goals? Guests of the High Atlas Foundation typically hear from all of us who work everyday to advance its human development mission. They hear our stories of volunteerism and experiences seeking to reconcile the divergent forces that can make what we all may all agree to be a shared good, but that are most often times incredibly challenging to achieve. The group of Fulbrighters came directly to our office after traveling from Ourzazate over the Tishka mountain pass. We receive them immediately, being there first stop after their long journey. We shared tea, lunch, thoughts, photos, and passing moments realizing first that we are among immediate friends, sincerely appreciative of one another, wanting to hear more from each other, inevitably parting ways after a sincerely memorable afternoon. Thank you for making HAF part of your Moroccan Journey. One of the good feelings is walking into a place for the first time and having flashbacks to childhood memories, and this is exactly what happened during my visit to the MOGADOR Cooperative. The Cooperative is in the center of Ounagha, 25 km from Essaouira, and it is surrounded by Argan trees which give the Cooperative a special charm. When you first step into in the building, you see different products on the roof: Argan oil with its main forms, pure honey, and Amlou. Each roof tells stories of multiple steps, manually most of the time, to obtain an organic edible or cosmetic product. 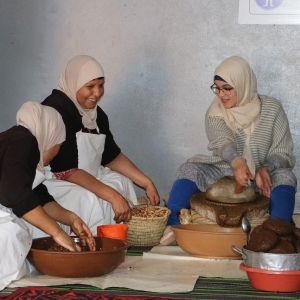 The women who work inside of the Cooperative respect certain steps in order to produce Argan oils. 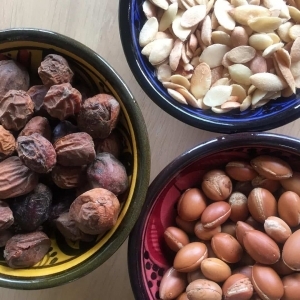 The first step lies in harvesting the Argan nuts and this step itself can be done through two ways: the first and common way is to collect the Argan nuts that fall from the trees, and the second method is to collect the nuts which goats spit out after eating the fleshy layer of the fruit. This step is done either in July or early August. Once Argan is harvested, they get dried in open air and then get crushed between two stones in order to reach the outer of the Argan nut with its hard brown skin. This gets manually cracked as well between two hard stones to get to the kernels where the amazing oil sits. Then, there is the step of separating the kernels from the cracked layers so as to start the extraction process. It is necessary to note that there are different extraction methods according to the type of oil wanted. Extracting the edible Argan oil demands roasting the kernels while the cosmetic does not. All these processes came to my mind as I was promenading through the Cooperative and projected the old memories onto the actual space. If you stop by the roof, chit chat will grab your attention and invite you to check its source, to find yourself in a hall with about ten women intensively working and engaging in talks at the same time. A traditional mill attracted me and I wanted to bring those memories back to the present life, so I decided to enjoy grinding the kernels in the mill. The smell of the roasted kernels reinforces this charm and reminds that we are taking a clean air in place of the pollution of the city. In order to keep the continuity of these magical moments, the High Atlas Foundation partnering with FRÉ Skincare offered 100 Argan plants to this Cooperative, which was glad to receive them. 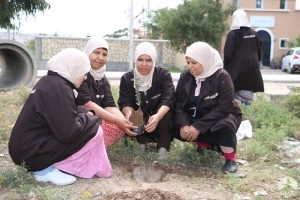 Women left their hall and joined us in front of the cooperative to plant an Argan tree. Before departing from this joy, my eyes spotted two beautiful twin girls playing around the roof peacefully. Watching these two identical girls made me reflect on my two identities as both Swiri [from the Essaouira region] and a Marrakchi girl. Thank you HAF for giving me the opportunity to revisit my roots. 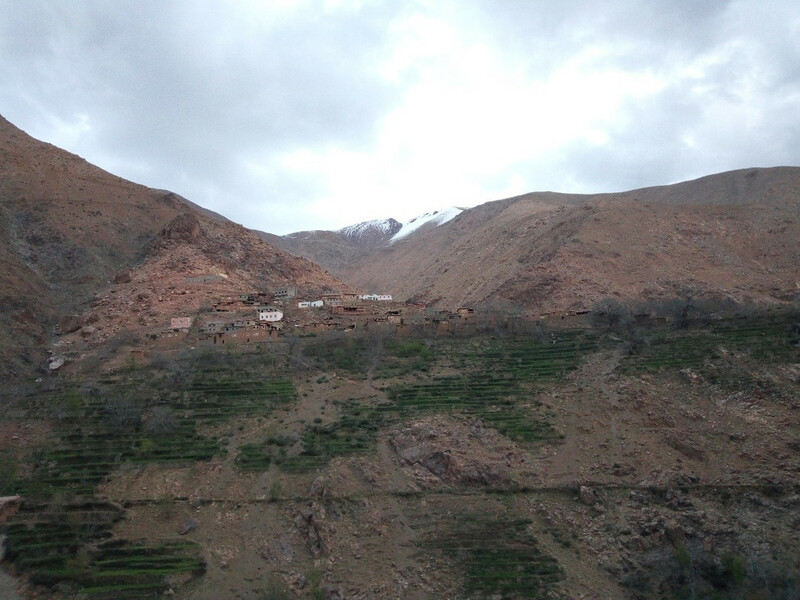 We are now in the Tifnoute Valley of the High Atlas Mountains after a long journey. It was a cold morning, and the snowy mountains reminded of the stormy night of yesterday. It was a crisp and cloudy but the radiant smile upon the faces of the people who came to greet us from early morning was enough to keep us warm. For a moment I didn’t feel at ease. It was hard to imagine myself in their shoes, and it was harder to try and put myself in their shoes. They asked us if we slept well and how was our night. They asked if we felt cold or not. We are not familiar these questions in our daily lives in Marrakech. After we ate breakfast, we moved to a classroom that is used as an office of a local association. Members of the local population arranged the tables before we arrived, and cleaned the room. The first thing that grabbed my attention was two ropes on a wall. Small stories in Arabic and French were hung as if they were waiting their turn to dry, but unfortunately, the sun of the light does not dare to cross the cold walls. Additionally, on the whiteboard, there was no trace of a lesson but the date of the last session, going back to three weeks ago. We have been told that schools were closed since the beginning of the national strike by teachers forced into contractual teaching started at the beginning of this month. We put the notebooks and pens on the tables and waited for the women to come. The fast wind hitting the open door and the window wasn’t an obstacle for them, neither was it for us as we watched the roads to see if more women were coming. They were following our movements to the small details. If we spoke with each other they did the same. If we came inside, they came. We started the workshop and we introduced ourselves. Ibtissam Niri, HAF’s empowerment trainer, Mrs. Rachida Oitoichki who is the president of the Aboghlou women’s cooperative in Ourika, and I. Miss. Niri asked the women to introduce themselves and that was the first step. Young women hesitated even before they say their first names and it was difficult for them to talk about themselves. I couldn’t forget one of the girl’s words when she said: “I am not doing anything in my life, I’m just waiting in my home.” They were waiting their turn patiently, to the extent that I thought they were hoping it’s never their turn. Some of them enjoyed sitting on the tables. They moved towards the women and young women sitting next to them and smiled. Some of them took the notebook, observed it carefully, and turned its pages again and again. Others held the pen in their hands and moved it between their fingers and then moved it to the other hand as if they were trying to remember how they used to write when they were at school a long time ago. There were two women who were older than the other girls. They both did not open the notebook nor held the pen, but watched them curiously and touched them carefully like they are touching a precious object. However, the two women were first to participate and express their opinions in Tamazight because they don’t speak Arabic. The teacher of the village Mrs. Khadija and Mrs. Rachida were interpreting from Arabic into Tamazight and vice versa. Miss Ibtissam started the workshop with a warm-up activity in the form of a brainstorming exercise. She asked the girls what they think about the word “Tamkine” [empowerment] in Arabic. There was a long silence colder than the weather itself, then chitchatting started. Miss Ibtissam tried hard to paraphrase the question and to invite the women to voice their opinion in their native language. Finally, one of the young women wanted to say something, she said innocently: “We really want to answer but we do not know how to think”. I couldn’t believe my own ears, nor could I believe how the other young women nodded their heads to agree with her. I thought that they were shy or that they were hesitating to speak in front of us because we are strangers but I could never imagine the real reason behind their silence. Miss Ibtissam tried to simplify as much as she could and then asked teacher Khadija to explain to the women in Tamazight. The women were familiar bit by bit by the axes of the workshop. Before we went to the lunch break, Miss Ibtissam explained to the women an exercise about their vision. She gave an example of the drawing of a clock on the wall far off in front of her, an idea to work toward and reach, to simplify what she meant by the word vision. She gave them white paper and asked them to write or draw their visions and work in groups of three to four young women. Before they started writing, they discussed their visions which are quite similar, and then asked one of them to write something like the other groups. Most of the young women who had been at school were struggling to write the first words. They stopped after two words in order to correct the spelling. Yeja is the name of one of the young women participating in the workshop. We had lunch in her family’s house and I discussed with her what she wants to do in her life. She was sure that she wanted to continue her studies. She stopped when she finished primary school because there were no secondary elementary schools in the region back then. She wants to be independent and to leave the village to get educated because education is the only way to make her dreams come true. I encouraged her to share her vision with the other women and that was what she did. She was hesitant at first but when she saw that no other young women wanted to share their visions, she volunteered to be the first. The other women followed carefully every step to answer the first questions that Miss Ibtissam explained beforehand on the board. Yeja stood up next to the board and tried to answer each question from her point of view and at the end, she made a statement in front of us all. Teacher Khadija wanted to do the same exercise and she followed the same steps as Yeja. When she was asking one of the questions, she expressed her sincere intention and will to help the young women get educated and in return, all she asked is their help and commitment. We finished the day’s workshop and we left all the young women to think about their statements. They were reluctant to leave the classroom. They waited for us in front of the classroom and kept us company until we arrived at the house of the family hosting us. After two hours they came back and joined us in the room where we were sitting. What I admired the most is that they really enjoyed our company and we did the same. Some do not speak Arabic; however, they were listening to us actively and asking their friends to translate for them from time to time. They did not talk even after the distance they walked and the mountains they climbed to reach us. they couldn’t express their feelings to us but they taught us that much of the meaning must be inferred from the context. I was glad to spend the last hours before sleep with such beautiful souls. 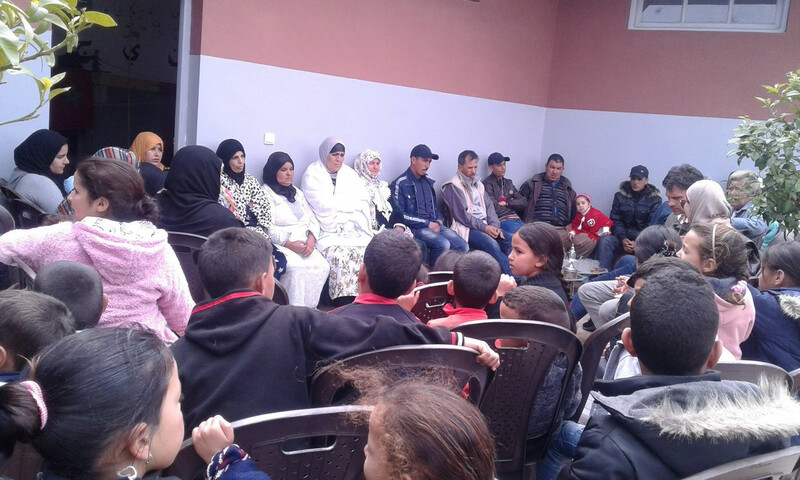 On Women’s International Day, the High Atlas Foundation visited the Association Assalam for Development in Douar Achbarou. This village is located in the Rural Commune of Tameslouht, which is only 20 kms away from Marrakech. Beforehand, the activities in this association were run by men only, but since last October, women were integrated into the association and started to work alongside their male peers. 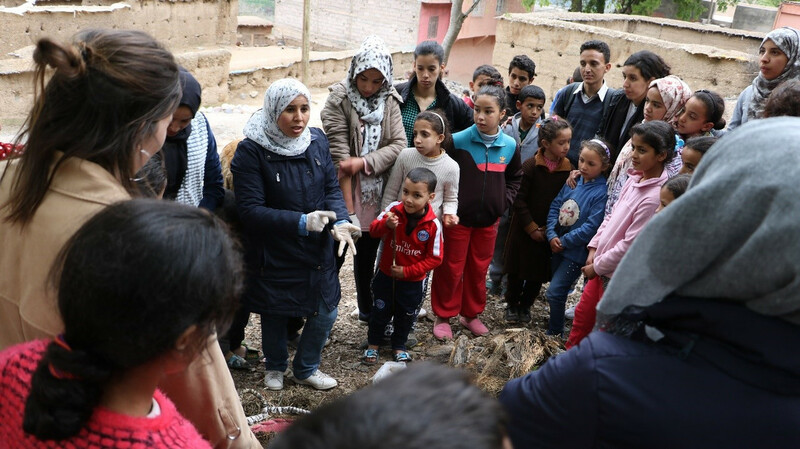 The area, like many other ones in the High Atlas Mountains, is traditional, and it was a huge step for these women to get out of their comfort zones and work inside this cooperative. 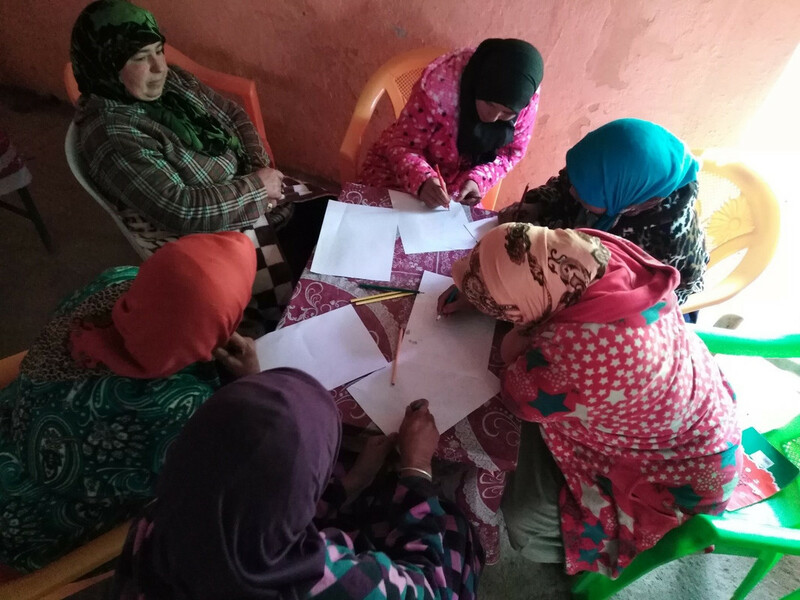 The idea of creating women’s cooperative was first discussed together with Mrs. Batoul, the president of Association Amal for Development of Women and Children in Achbarou village. 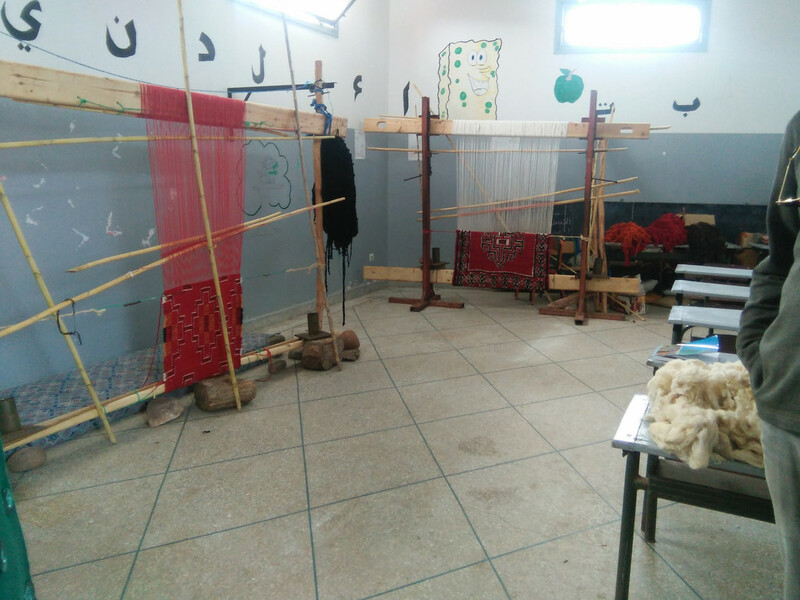 Amina Hajjami, Project Director at HAF, prepared a folder and submitted it on the 10th of October to OCP which financed the looms and other materials for the cooperative. As mentioned earlier, women were integrated in the association of men where they occupied three rooms to embroider, crochet and weave carpets. 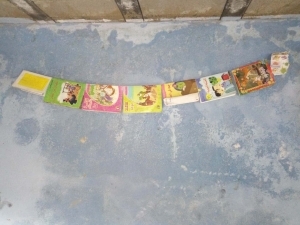 Additionally, a part of the carpet-making room is devoted to learning where women develop their literacy skills, and another room nearby is used for a preschool class. The room where women make traditional carpets and learn how to read and write. The women warmly welcomed us and were keen to show us what they made during these five months. We can divide these women’s activities into three groups according to their age: older women who craft traditional carpets, middle aged women who make crochet products and young women who learn tailoring. 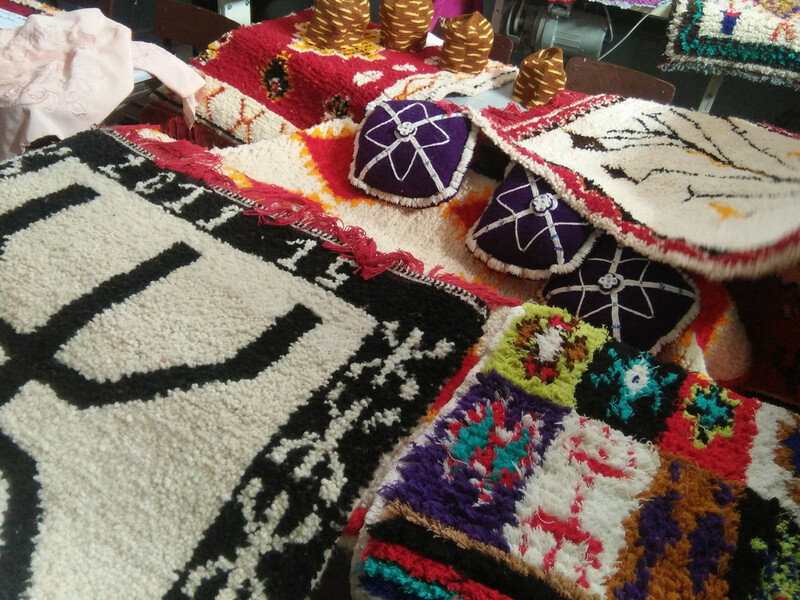 It is good to mention that there is interaction between women from Douar Akrich who make handicrafts (carpets mainly) and other women from the Achbarou, who crochet. The carpets are made by women from Akrich while the crocheted hats and cushions are made by women from Achbarou. In the courtyard, we gathered with both men and women from this cooperative to drink tea. 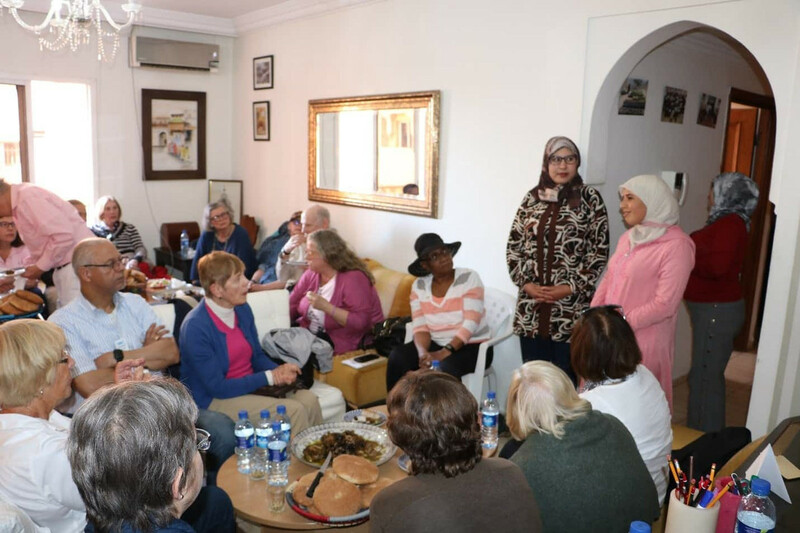 At the same time, the women thanked the presidents of the cooperative, Mr. Said Idmansour and Abderrahim Badah, for giving them this opportunity to work inside their association. The men as well appreciated the step which women are taking to improve themselves on both financial and personal levels. “Unlike the past, we have freedom now; for example we can now go to the market, while it was a privilege that only men could have.” said one of the women. Doriss, a German lady who owns an hotel in the neighbourhood, explained how she has always been against the idea that women shall stay at home. “ Women need an outlet away from their houses,” said Doriss. Furthermore, the women’s teacher is doing this job for free. She is instructing them on how to sew and embroider without anything in return even though her husband is against this idea. » I would love to earn money from this daily work, but what encourages me to do this job for free is these women’s strong determination. » For this reason, HAF’s representative recommended her and the girls to go to Chambre d’Artisanat and submit their application forms in order to get a diploma which will allow them to teach in other villages. The same thing goes with the elder women who transfer their carpet-making skills to the new generation. Mrs. Batoul is now implementing the idea of creating women’s cooperative which was only a topic of discussion with HAF last October. Yet, it is important for these women to receive training on how to create a cooperative within a legal framework. Accordingly, HAF will conduct the training as well as a workshop on how can these women empower themselves. After this rich discussion, we have all moved to the garden where women served a traditional and delicious meal for lunch. Before leaving this beautiful place, some girls performed a play in front of the rest members of the cooperative. This play tells the story of two women who were offered to go to school and combat illiteracy. One of these women were not allowed by her husband and was obliged to stay at home, while the second woman welcomed the idea, broke the social norms and got educated. At the end of the play, women insisted on sending their daughters to school to learn and be able to raise an educated generation. These two women were an example out of many who live in rural areas and want to widen their horizons and expand themselves. A view of the village from the opposite side.